T cells are an extremely heterogeneous population composed of various subsets which interact in a complex manner during an immune response. 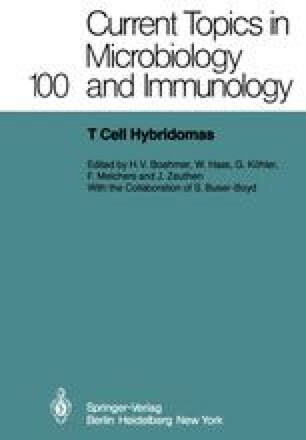 Furthermore each T cell expresses an antigen-specific receptor unique in its discriminating capacity and in its restriction by gene products of the major histocompatibility complex (MHC). The availability of defined T cell clones should help elucidate the nature of T cell specificity and the function of particular T cells in immune circuits. We have produced T cell lines either by growing T cells from immune mice with antigen, antigen-presenting cells (APC) and T cell growth factors (interleukin-2, IL-2), or by immortalizing T cells after fusing them to T lymphoma cell lines. Some of the results obtained in this work are summarized here.